The S&P 500 is up 14% in 2019, but some high-yielding stocks are trailing the market. We detail three mid-large cap stocks with payout ratios of 41% - 60%. They all issue 1099s - no K-1s. Last week we detailed eight high-yield income vehicles with industry tailwinds. This week we're looking at the other side of the tracks - high dividend stocks which the market has left behind due to company-specific or industry concerns. Century Link (CTL) has been beaten up by Mr. Market over the past six months-plus, falling from ~$24 in August 2018 all the way down to $12.11. 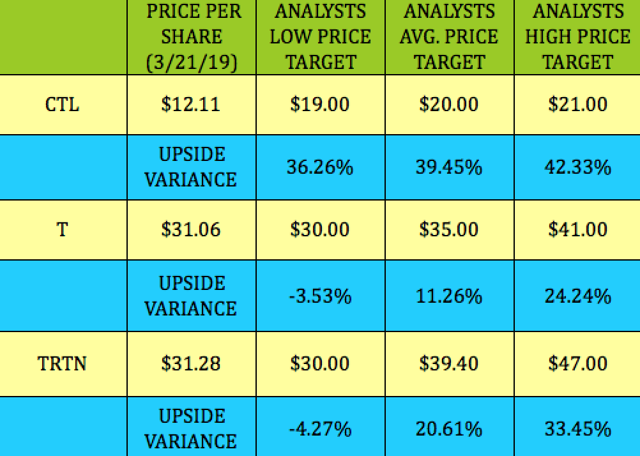 A big dividend cut from $.52 to $.25, announced in February 2019, caused part of the decline, and numerous analyst downgrades also have weighed on the stock price. Management cut the dividend in order to deleverage the company, and is targeting an EBITDA leverage ratio range of 2.75X to 3.25X for 2019, vs. the ~4.2X CTL averaged for 2019. At&T (T) is actually positive in 2018, having risen 8.8%, but it still trails the market by a wide berth, with the S&P 500 up over 14% this year. The Time Warner acquisition was finally approved in 2018, but the worry now concerns T's large debt load of $176B and the integration of the Time Warner assets. Management has stated that its main focus in 2019 will be paying down its debt. Triton International (TRTN) is the world's largest lessor of intermodal containers and chassis. Intermodal containers are large, standardized steel boxes used to transport freight by ship, rail or truck. Triton jumped to the top spot in July 2016, after it merged with TAL International Group. TRTN is roughly flat in 2019 due to concerns about slower world economic growth, brought on by trade wars. Slower or negative growth could put a damper on container leasing. Concerning the US-China trade war, management has said that it's creating uncertainty, but that they expect demand to improve seasonally in the spring. Although Q4 is usually a slower period, TRTN's fleet utilization remained high at 97.6%. All three companies had free cash flow growth in 2018, with CTL topping the list, at 146%, due to its big acquisition of Level 3 Communications. 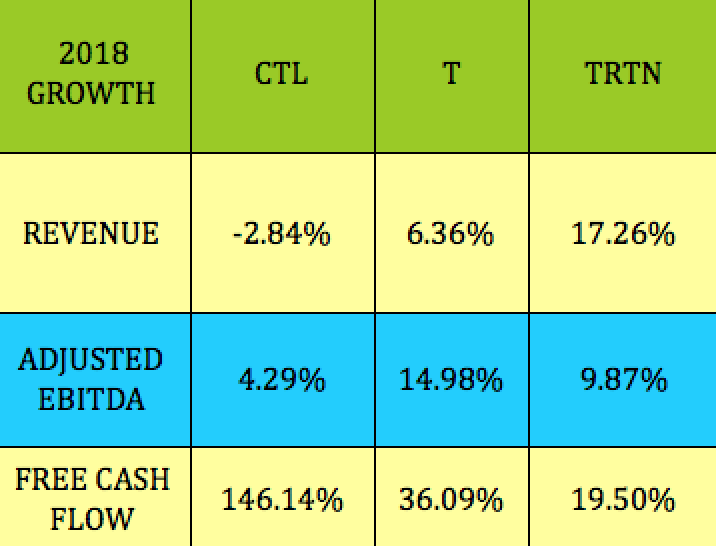 T leads the group in EBITDA growth, showing ~15% in 2018, whereas TRTN had the biggest revenue bump. Prior to CTL's 2019 dividend cut, management had kept the quarterly payment at $.52 over the past five years, so the trailing dividend growth rate is 0%. However, it will of course be negative moving forward. T has had modest $.01/share annual dividend hikes since 2013, which accounts for its low 2.06% growth rate. TRTN's 55% growth rate is misleading - since they only started paying in Q3 2016 - when they paid $.45/quarter, which they maintained in 2017, for a total of $1.80. Management raised it to $.52/quarter, starting in Q2 2018 for a total of $2.01 in 2018, which was an 11.67% raise vs. 2017. Even with its lower quarterly payout, CTL has the highest yield in the group, at 8.26% due to its big price swoon. T and TRTN have very similar yields at ~6.6%. The trailing payout ratios listed below are based upon free cash flow, and they range from a low of 41.19% for TRTN, to 59.87% for T, and 59.94% for CTL. All three of these stocks issue 1099s at tax time. TRTN also issued its first preferred shares in mid-March - an offering of 3.0 million 8.50% Series A Cumulative Redeemable Perpetual Preference Shares, (NYSE:TRTN.PA). They're currently at $25.50, with an 8.33% dividend yield. CTL's management issued FCF guidance in a range of $3.1B to $3.4B for 2019. Using the average, $3.25B, and comparing it to CTL's actual 2018 FCF of $3.857 billion indicates negative FCF growth of -15.74% in 2019. TRTN hasn't issued forward guidance for full year 2019, as of yet. CTL had negative net income, which accounts for its negative ROA and ROE figures in 2018. Its net debt/EBITDA and net debt/equity leverage are both higher than T's, and its Interest coverage is much lower. Management is targeting an EBITDA leverage ratio range of 2.75X to 3.25X for 2019. TRTN's ROA and ROE have remained relatively stable - they were 3.65% and 16.82%, respectively, as of 12/31/17. Its net debt/EBITDA leverage has improved significantly, decreasing to 5.92, as of 12/31/18, vs. 7.04 on 12/31/17. Its debt/equity leverage has been flat, at 3.42X. CTL and T both have telecom assets, but T has a much wider scope of activity, with its recent acquisition of Time Warner. CTL's very low price/book of .65 stands out, but T's 1.17 price/book is pretty cheap also, when compared to its historic P/book valuations, which have run closer to ~1.75 to ~2x in previous years. The market is demanding a higher yield from CTL for all of the "agita" that the recent dividend cut created for income investors. We added TRTN's biggest competitor, CAI International (CAI) as a comp for TRTN. The biggest difference here is that CAI pays no dividend, whereas TRTN yields 6.65%, which the market has rewarded by giving it higher P/book and P/sales valuations than CAI. TRTN is a much larger company, but it has a much lower EV/EBITDA than CAI. 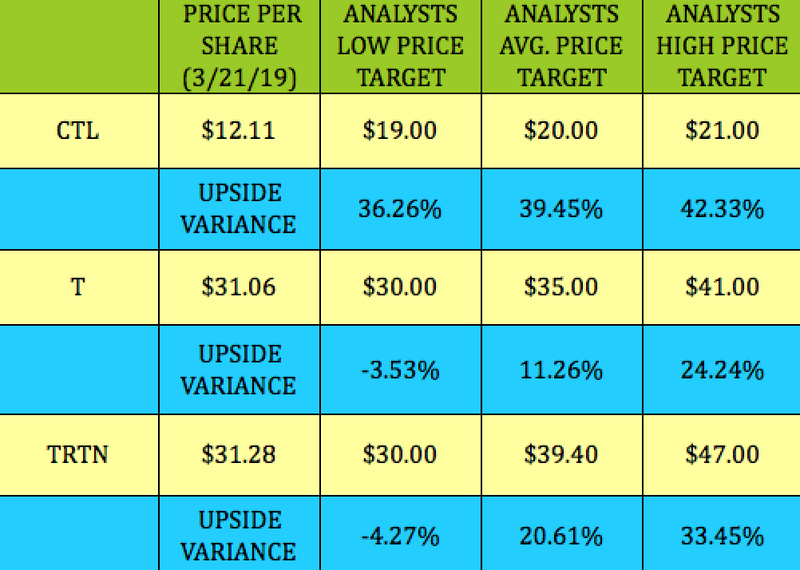 The most volatile stock of this group, CTL, has the biggest variance between its current price and analysts price targets, with a low price target of $19.00 being 36% above CTL's current $12.11 price, and the average price target of $20.00 being over 29% above the current price. With the mix of ambivalent to negative sentiment for these stocks, you may want to consider hedging your bet via selling options. All three of these stocks have options. Historically, T has been a good stock to write covered calls on due to the normally trading in a tight range. This changed in 2016, when it ran all the way up to the low $40s, only to drift down to the mid-$30's in 2017, and ~ the low $30's in 2018. It dipped below $30.00 in the Q4 '18 pullback, but has since rebounded a bit, to $31.06. TRTN goes ex-dividend again in late May for a $.52 payout. Its July out of the money, $35.00 call strike pays $1.00, nearly 2X the quarterly dividend. Our Covered Calls Table has more details for these trades and over 35 others, all of which are updated throughout each trading day. Selling Puts: Clearly, CTL has the most negativity attached to it, so it might make more sense to try and nibble at the edges, via selling cash secured puts. We added this July put trade to our Cash Secured Puts Table, which also has over 35 other trades. We rate T and TRTN as Buys, which can be further hedged with covered calls or with cash secured puts. We rate CTL as a speculative buy - best approached via selling cash secured puts. We publish exclusive articles each week with investing ideas for the HDS+ site that you won't see anywhere else. Disclosure: I am/we are long TRTN, T, CTL. I wrote this article myself, and it expresses my own opinions. I am not receiving compensation for it (other than from Seeking Alpha). I have no business relationship with any company whose stock is mentioned in this article. Additional disclosure: We have 2 investing services - our independent service, www.DoubleDividendStocks.com has focused on selling options for high dividend stocks for the past 10 years. Hidden Dividend Stocks is run trhough the Seeking Alpha Marketplace.